On November 29, 2017, the Minister of Foreign Affairs of Turkmenistan R. Meredov had a meeting with the Deputy Foreign Minister of Japan on parliamentary issues, Mr. Horia Manabu, who arrived in Turkmenistan to attend the 28th session of the Energy Charter Conference. 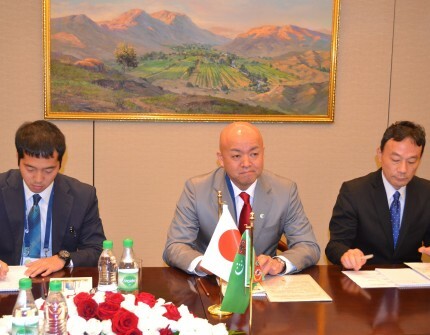 During the meeting, the sides noted with satisfaction the growing dynamics of fruitful cooperation between Turkmenistan and Japan in a wide range of areas. In this context, the role of high-level visits in the development of traditionally friendly relations between countries was noted. The sides discussed issues of political and diplomatic cooperation, including within the framework of international organizations. Noting that within the framework of Turkmenistan's chairmanship in the Energy Charter Conference in 2017, the country's efforts were directed to further development of cooperation between all interested states and international organizations in the energy sector, the sides discussed the possibilities for further consolidation of joint actions in this direction. In addition, the parties discussed the possibilities of intensifying mutual contacts in the trade and economic sphere to bring relations to a qualitatively new level. Among the areas of mutual interest, the parties also noted the cultural and humanitarian sphere. In this context, the issues of development of cooperation in the field of education and sport were considered. At the end of the meeting, the sides noted the great potential for building Turkmen-Japanese relations and stressed the need for continued support of regular contacts at various levels.